Soak the tamarind, and squeeze to make about 2 to 3 cups of juice. Heat oil in a pan, add mustard seed, splitted channa dal, fenugreek seed, curry leaves , manathakali vathal(dried variety of small tomatoes) and saute few seconds. Add redchilli, sambar powder to cook until the raw flavour is extracted. Add tamarind water & salt and boil until the mix is reduced by half. 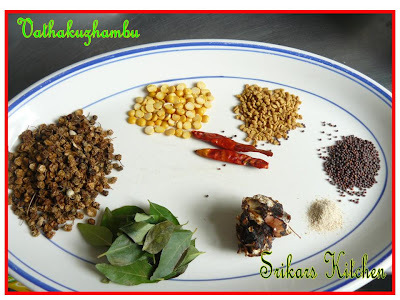 Add a small amount of rice flour by diluting it with little water & add to finish kuzhambu. Serve hot with rice. Will go very well with Pappad. 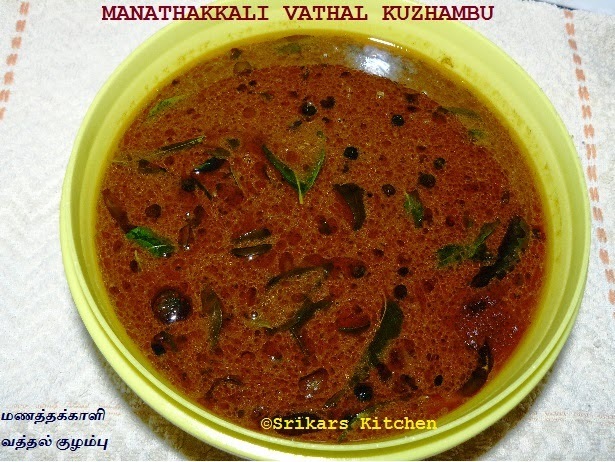 vathakuzhambu is something that I(and my family members) can have everyday. Tastes best when made with onions.. yummy! You used manathakkali! I like it a lot... but never made it. Haven't checked if my Indian grocery store carries it. 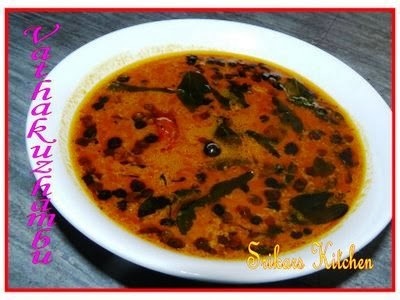 love the tanginess of manathakkali.. I've never had this, but it looks amazing, I love the color! All that I need for a satisfying meal is this with some curd rice. I've posted my version with home made chundakka vathal. Manathakkali vathakuzhambu and sutta appalam is one of my favorite. perfect picture..this is how the kozhambhu made my mom will look! i luv it so much with aloo! yummy! Wow wat a delicious kuzhambhu, love them with hot rice n papads..my fav one..
Hi I've been reading ur blog for quite some time now.Liked all ur recipes.Vatha kuzhambu is an all time fav.so after reading ur blog I made it today after a long time.came out good :) BTW am a friend of Mahima and I came to ur blog thru her. I make it like this too.. a favorite for sure.